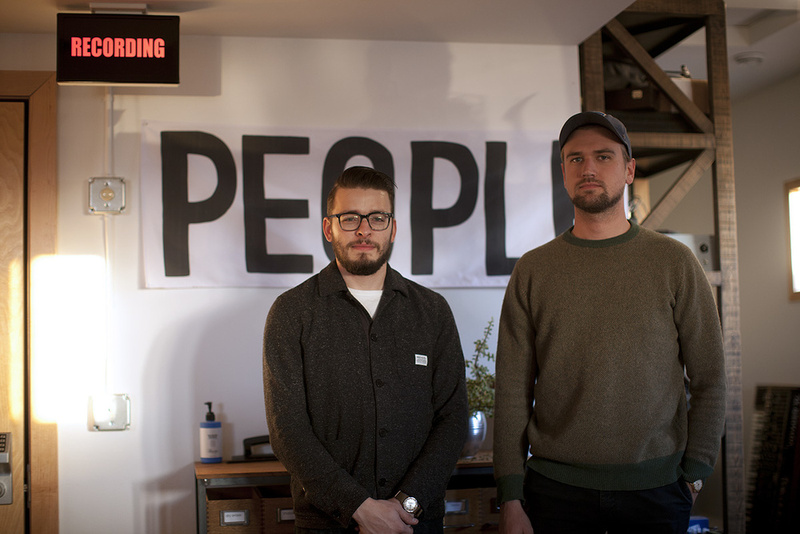 Recording People: Chris Messina (left) and Zach Hanson at April Base Studios. Thus spoke Justin Vernon during a press conference organised to promote 22, A Million, his third album under the Bon Iver moniker and one that inhabits an alien sonic world, featuring heavily processed massed vocals, saxophones and pianos, as well as tons of samples and other musical instruments, all treated with crunching distortion, sonic break-ups, drop-outs, and other bizarre and often random-sounding sonic artifacts. The weirdness of 22, A Million extends to its song titles, which include numbers and cryptic symbols, while the credits are deliberately obtuse. Vernon is credited as Maker, which seems clear enough, but this is followed by credits for Chris Messina as Maker’s Maker, BJ Burton as Noble Black Eagle, Ryan Olson as Scream Defence, Brad Cook as Wings, and so on. The producer credit, meanwhile, goes to April Base, which is Vernon’s studio and not a person at all. The publicity campaign for 22, A Million was suitably odd as well: Vernon gave no interviews and only one press conference at the Oxbow Hotel, in Eau Claire, Wisconsin, his place of residence, an hour’s drive east of Minneapolis. (Vernon is one of four investors in the hotel, so the press conference presumably helped with the promotion of that too.) Vernon elaborated on the early origins of the album, which occurred during what his friend Trever Hagan called “a misguided solo trip to an island off the coast of Greece”. “It was a very bad time,” Vernon confirmed. “I was trying to find myself, but did not! I was incredibly bored and panicking a lot, walking around this town for a week. One day I got back to my room and sang a little improvisation into this little sampler, the [Teenage Engineering] OP-1. When I chopped the sample, it sounded like ‘two’ ‘two’, and 22 is my favourite number, because it always reminds me of paradox, the two sides of a coin, duality in general. I had sung the phrase ‘It Might Be Over Soon’, which could both mean ‘Oh, no, I wanted it to last forever,’ and ‘Thank God, I really don’t want to feel like this any more.’ So that was the beginning. When I figured out that the album was going to be about numbers, with 22 being my thing, it grew from there. The experimental direction for 22, A Million apparently was set during work on one of the most iconic tracks of the album, ‘10 (Death Breast)’, an insane-sounding mash-up of distorted drums and bass, over which float Vernon’s massed and heavily treated vocals, strings and a pitched-up sample of a YouTube video of Stevie Nicks singing in her dressing room. “BJ Burton and I had this drum loop for a long time, which sounded broken down, messed up,” explained Vernon. “What I was going through, and what I found other people were going through, was a lot of anxiety and things like that, which made me want to break things down and crush something, and do something aggressive-sounding. The song was kind of almost finished when we made it, but it became like a pivot that I wanted to build around: ‘OK, this sounds like breaking open a new fabric.’ That was the moment I knew where I needed to go. Most of the recordings for 22, A Million took place at Vernon’s April Base studio in Eau Claire, over a period of nearly three years. After Vernon, the central figure at April Base, and also in many ways in the making of 22, A Million, is the ‘Maker’s Maker’. Chris Messina is April Base’s manager, and also the man behind several of the most distinctive sounds on the album. Indeed, one of the main effects used is ‘the Messina’, designed by and named after him. Messina first encountered Vernon as an employee of Cleveland live-sound company Eighth Day Sound, working with “pretty much any act you can think of, from Tom Jones to Lil Wayne to Madonna”. In 2011, Bon Iver was one of these acts. “Justin and I became friends during that tour, and part-way through the tour he said, ‘You should move to Wisconsin and run my studio.’ So in 2011 my now wife and I moved here from New York. The studio at the time was basically a Pro Tools rig, a couple of [Teletronix] LA-2As, some [Neve] 1073s and some microphones, and Justin said: ‘Let’s turn this place into a proper studio.’ We began with Studio A, which has gone through four incarnations now, and over the next couple of months we’re going to redesign the room again. We want a more electronic, in-the-box workflow, with lots of table space for people to put their laptops and gadgets on, and desktop patch panels everywhere so you can just plug in and go. The idea is for the space to encourage on-the-spot collaboration. According to the Maker, “the bulk of the record was made at April Base”, though not before he had spent some time in London, and six weeks near Lisbon with Messina and BJ Burton “trying out things”. 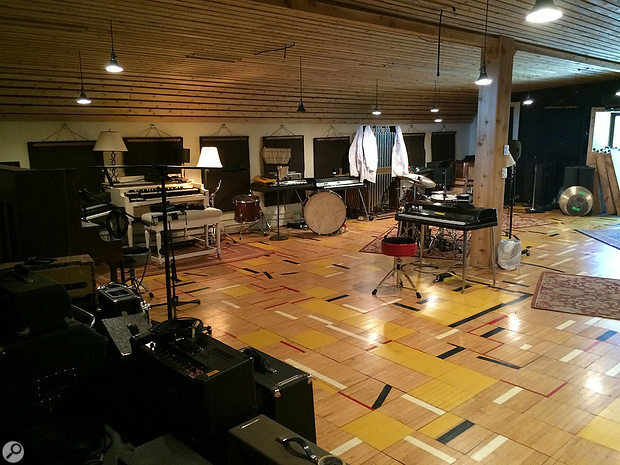 Messina adds that many of the ideas came about through jamming in the studio’s large live room, which is tied to both Studio A and B. While many people were involved in the making of 22, A Million, at the core was the trio of Vernon, Messina and Noble Black Eagle, aka engineer BJ Burton. 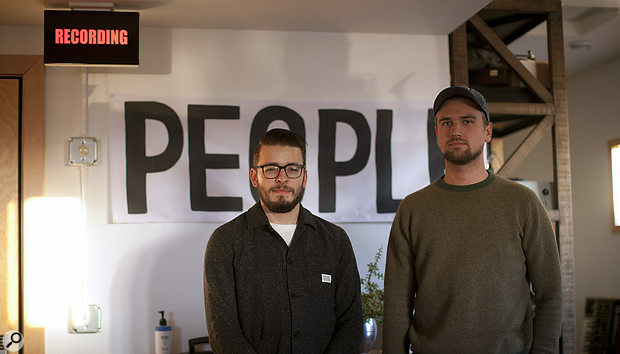 For the mix sessions in the first half of 2016 they were augmented by Ryan Olson and Zach Hanson. According to Messina, the roles everyone played overlapped, but in general, Burton was running Pro Tools most of the time during the recordings, and creating a lot of the drum tracks with Vernon, while the Maker’s Maker himself often was, well, making things. “My main job was keeping April Base going, because I’m the one who knows how to use everything. So I’m mostly the studio guy, but in addition Justin places a lot of value on my creative input, which is pretty rad. So a lot of what I was dealing with was the question, ‘Oh, we need a cool new sound.’ This was a general question that everyone was involved in, and could involve using a reverb of some sort, guitar pedals, improper mic techniques, going through tape machines, like our Ampex ATR102 two-track, mangling tape, anything to find new sounds. “Many of the recordings were recorded on a compact cassette, and we’d rip it open and crumbled the tape, or wrote on the tape, and we’d then put it back in and played it. This is what caused the crackling and dropouts in ‘22 (Over Soon)’, for example. It’s the first track on the album, so definitely sets the tone. We ran with that in a lot of ways. Almost every song on the record ended up being mixed down to the ATR102, though that is not what we were using for distortion. But there definitely was tape all over the thing. There also are a couple of places where Pro Tools dropped out when it wasn’t happy about something, and for whatever reason it recorded that unhappiness, and we just left it. It’s the vibe of the record, it’s where we were at. ‘Just leave that!’ Yes, we’ve heard from many listeners that they think there’s something wrong with their playback equipment, and we’re OK with that. So enter Zach Hanson. A graduate of McNally Smith College of Music in St Paul, Minnesota, Hanson works as both a drummer, playing for the likes of The Tallest Man On Earth and Sean Carey, and as a recording engineer. Carey is Bon Iver’s long-term drummer, and in 2012 Hanson became drum tech for both drummers — Carey and Matt McGaughan — during a Bon Iver tour. From there Hanson carried on working regularly for Vernon at April Base, mostly as an engineer and mixer, clocking up credits like the Staves, Blind Boys Of Alabama, and Sean Carey. Hanson is freelance and also works on many other projects, sometimes at his home facility, where he has Pro Tools with the UAD Apollo interface, Mackie HR824 MkI monitors, and a smattering of outboard, like the Manley Vari-Mu compressor, GML 8200 EQ, and an Overstayer NT 02A Saturator. Hanson got the job of mixing 22, A Million because of his mixes of the Staves’ EP If I Was (2014) and album Sleeping In A Car (2015), which were both produced by Vernon. When final mixing started in earnest in May 2016, the songs had already taken shape, but Hanson was nonetheless given free rein to reinvent things. The Duality’s digital dimension also helped with the endless recalls as Hanson and co moved between songs. “The nice thing about the Duality,” explains Hanson, “is that it takes digital snapshots of all the faders and knobs, so you don’t have to draw all the different settings. Also, a lot of the EQ and compression were done on the desk itself, so these were easy to recall. As for outboard, we kept all the patching the same for all songs, which meant that sends and returns were always in the same spots. We also tried to keep the outboard on similar settings, not for ease of use, but because we wanted to maintain cohesion between the songs and put them in similar sonic spaces. These sessions took place over nearly three years, so they did not necessarily sound the same, and having reverbs and outboard on similar settings was a good way of glueing the songs together. 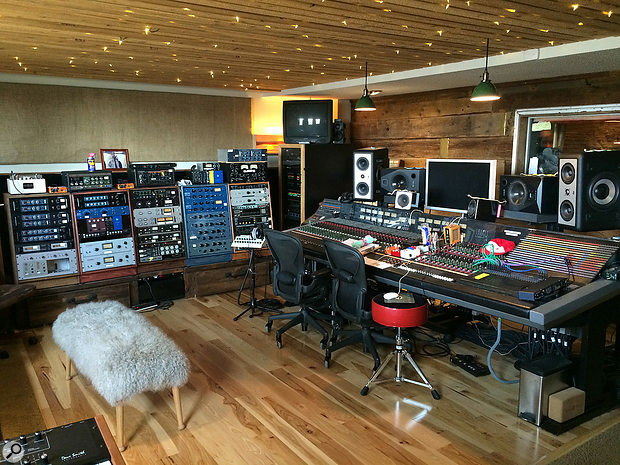 Once final decisions had been made on what musical elements to include and what shape to give them in each song, the final stage of Hanson’s mix process consisted mainly of balancing and sonically massaging the ingredients, using the SSL desk, plug-ins, and outboard. The latter, said Hanson, consisted mainly of the Bricasti M7, set to ‘Dark Chamber’, and a couple of AMS RMX16 units, for most of the reverb, as well an AKG stereo spring reverb and a EMT 140 plate reverb. 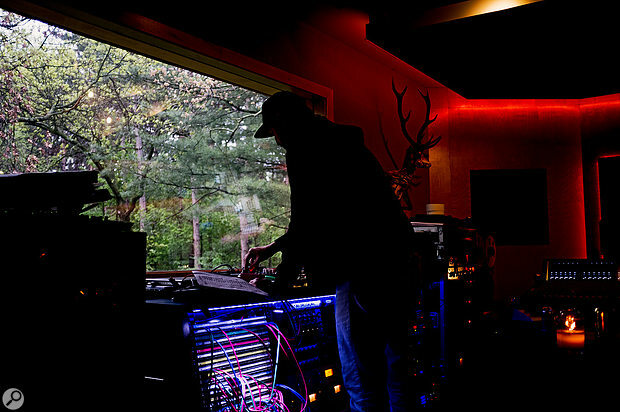 The Pro Tools session for ‘Death Breast’, with its jumble of tracks, reflects Justin Vernon’s instinctive approach to recording.“Justin also talked with me about the found-cassette analogy. You take the cassette home, and when you listen to it, it has all these weird bits of fragmented song and things coming in and out as if out of nowhere. It’s not entirely unfamiliar, but at the same time it’s a new way of listening to music. So during the writing and recording they had found these really weird, fucked-up, distorted, fragmented sounds, and my job during mixing was to make sure these sounds translated. After the initial sculpting what I did was more scientific. 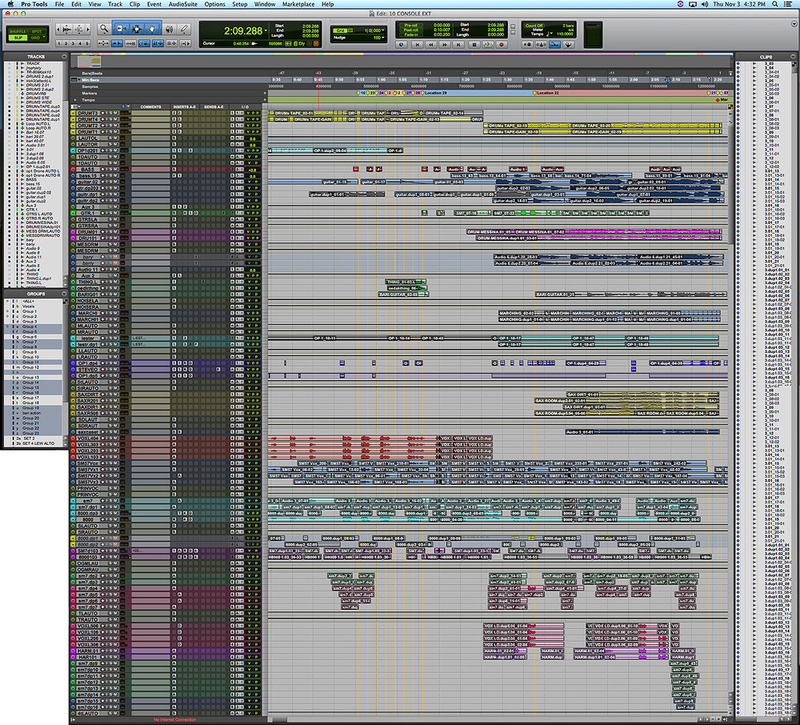 A quick look at the Pro Tools Edit window for ‘Death Breast’ immediately reveals what Hanson was talking about regarding the complexity of the session. The track list on the left shows just over 50 tracks, and reveals fewer than a fifth of the tracks, suggesting a total of over 250. The main edit window shows over 80 tracks, but again, not all are visible. The order of the tracks is also slightly muddled, with the four heavily distorted ‘Drums Tape’ tracks at the top of the session, followed by an OP-1 sample track, two bass tracks, and five guitar tracks. No fewer than 36 vocal tracks are visible, and the session contains numerous automation tracks, usually containing the letters ‘AUT’. These are ‘ghost tracks’, with each having an SSL Duality control plug-in on the insert to connect the session to the SSL desk. “These screenshots demonstrate Justin’s workflow”, explains Hanson. “When he is creative, he moves very quickly. It is easy for him to create a dozen tracks, or just duplicate tracks and record layer upon another layer. That plays a huge role in how he writes and arranges songs. He will sit down with an SM7 in front of him and sing one line in one section of the song, and then he will duplicate that track, and sing another line. He will do that throughout different sections of the song. In many of these songs there are 40 or more tracks of vocals, in blocks of six vocals in one section of the song and eight vocal tracks in another part of the song. In ’33 “God”’, he stacked pianos in a similar way, layer upon layer of layer. It’s how he develops the sound that he wants to hear. 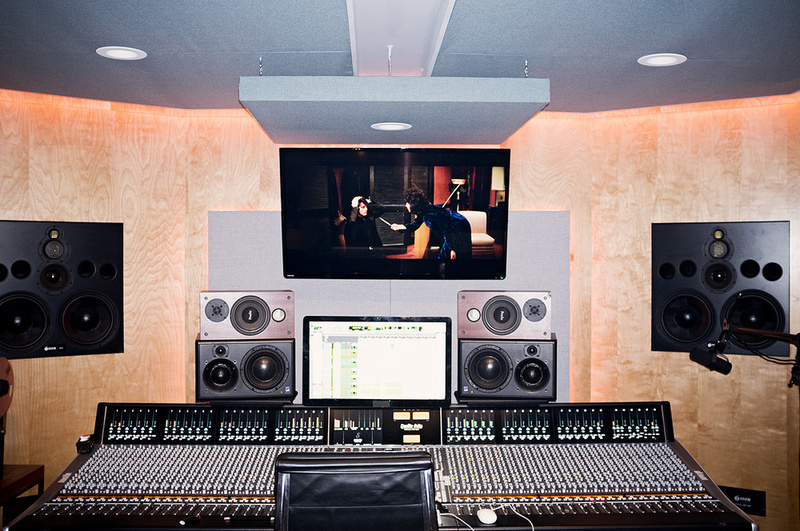 22, A Million was mixed on the SSL Duality in April Base Studio B. The session is not heavily populated with plug-ins because, as Hanson explains, he primarily used desk EQ and compression, and also, given the heavily treated nature of the source material, there was no need to treat things a whole lot more in the mix. 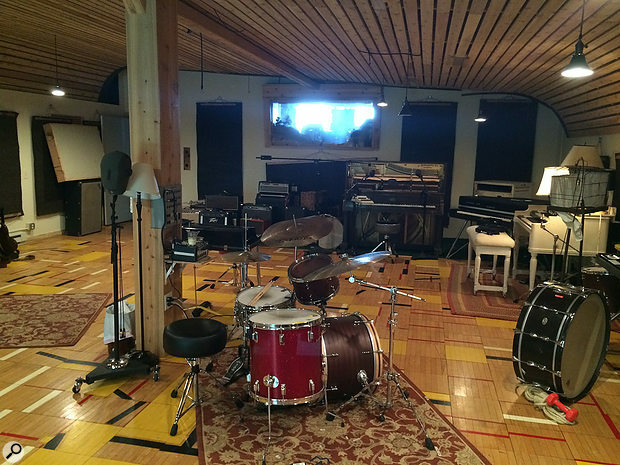 Those that were used include the Waves L2, which is on each of the four distorted drum tracks, “which may have added some distortion, but are mostly there to level them, so they become this brick wall of drums that is constantly in your face. The bass track also has the Duality board plug-in, but I don’t think we did any automation here. It was more to do with the Harmonic Drive knob on the desk that I used to add more harmonic distortion. “There’s a Waves Vitamin plug-in on the other bass track, and this is the result of a bad habit of mine. When someone else is at the board, I sit in the back of the room humming the root notes of the song, which has a tendency to throw off whoever is at the board. So Justin had written this bass part, which is not the distorted part, and he said, ‘Can you make it sound like you humming in the background of the room?’ The Vitamin is a kind of multiband compressor, but rather than compressing it also expands, and in this instance it is adding probably 80Hz and below. “There’s an Aux 3 track, with the Waves Puigtech EQ, Avid EQ1 and UAD LA-2A. I generally use aux tracks a lot when mixing in the box, but this aux track is a rarity in this session, because we did so much on the console. It’s an aux on the guitars just above it. The green guitar track next to it has the Waves Renaissance Axx and H-Delay and the D-Verb. Further down are three dark blue tracks, called ‘OP1’ and ‘SteveOud’, and they again have the Axx and also the Avid D-Verb, and tons of instances of the Avid EQ1. Usually the EQ1 is there as a high-pass or low-pass or to notch out one gnarly frequency. It’s such an easy plug-in to throw on, and I find that using two of those instead of one EQ with two bands gives me a more musical sound. I think you get less phase distortion like that. Often when you notch something out, you create another notch elsewhere. When I use multiple instances of the EQ1, I find that it does not happen, or if it does happen it is not as present. 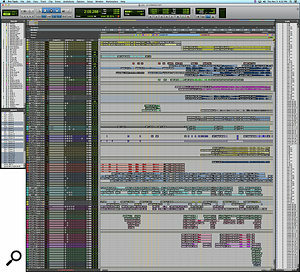 “Again, you can see in the screenshot how Justin layers his vocals, with red and blue and green tracks. Every single one of those will be an individual take. 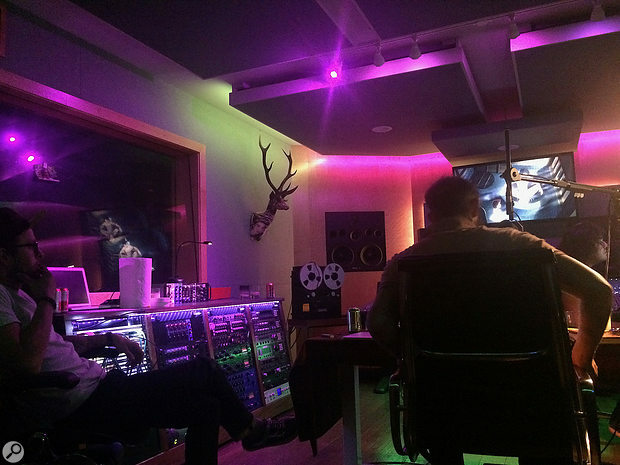 The red tracks will all be the same voicing, and he layers them to create richness, and one big vocal sound. He may use different SM7s, or sit at different distances from the mic, for variations in tonal colour. Almost all these vocal tracks have Auto-Tune, which is part of his sound. We had a lot of discussions about this, because it doesn’t only tune his vocal, it also adds a kind of saturation that can be really musical and that you can’t get from a compressor. Of all the crazy effects on 22, A Million, perhaps the most prominent is a device created by and named after engineer Chris Messina. There have been reports that The Messina is based on the Prismizer, which is software designed by Francis Starlite (of Francis & The Lights). However, according to Justin Vernon and Messina, the Prismizer was only an inspiration and does not use the same technology. Messina elaborates on how he devised the Messina. “Inspired by what Francis did, Justin and I got together and we tried every single vocoder that was listed, but they all sounded like a vocoder, which was not exactly what we wanted. Instead we wanted to be able to keep the character of whatever input signal we used, whether a voice or a saxophone. So instead we developed this thing which basically is a glorified vocoder. The input signal goes into Ableton Live where it is treated by two Auto-Tune plug-ins. The first just tunes the vocal, in the way Justin has always done it, and the second plug-in creates just a single note, the tonic of the key of the phrase that is sung or played, and that then is sent to an Eventide H8000, which is set to a MIDI harmony program.